Tested on vanilla mob. I found that only monster can be disable and animal can not. Perhaps passive mob like sheep, pig or bear from MoCreatures will spawn in new generated chunk. And monster will spawn only when player is nearby. That's why I can't disable them? I'm on Minecraft 1.10.2, and using this mod version 1.1.7. 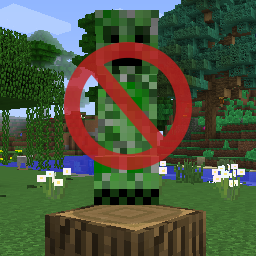 It's been a while, but before I could turn off Creepers with "dim:0 & mob:EntityCreeper"
However, this rule seems to be ignored now. Is there something new I'm missing? I went through the wiki, but there doesn't seem to be anything related to this. Excuse me, is it possible to add the Biomes O' Plenty to the config file type? If so, can you show me how or what to type in the config file? For current version (1.1.5), there is no way to select a group of biomes or mobs from a specific mod. If you just want to select a single biome or mob, you can use strings like "biome: RedwoodForest" or "mob: rosester". The biome names or ids can be found in BoP's config file. Sadly, the config file of BOP are only gameplay and misc., which neither supply the name or IDs. Deleting the folder and running Minecraft to see if the folder would give the others configurations, would be fruitless for the same config files. How would you write the string if I may ask? biome: RedwoodForest as suggested? Or is the string more specifically? I don't mind adding each one individually. woodlogs # This line disables mob spawning on all types of wood logs. # The above line disables mob spawning on mushroom blocks. # Extra spawning tries per tick. This will only applies to hostile mobs. # The capacity is the maximum (approximate) number of creatures can exist near the player. If you just want to disable mob spawning on wood logs, you don't need to change anything. The "woodlogs" indicates any kind of wood logs, including the logs in Biomes O' Plenty or in other mods. Odd. I generated a map of Redwood, but enemies still spawned. Hey man, your mod is awesome! I think it will be perfect for my modpack Cloudy Industries on Technic Launcher. Can I add it to my pack? Yes you can. Enjoy it! Got it working by setting a rule for "dim:0 & mob:EntityCreeper"
Before that I had a repeat command block killing creepers, but it was annoying. Also, a suggestion: if it's possible, allow to force a reload of the config file via command. Actually it is there. Use /nmsot reload to force reload. Woot! :D Thank you so much! By the way :P I was wondering if you could explain the "position" and "chance" tags a little more. Is "position" always relative to the position of the player? And, I'm guessing it's coordinates in "X, Y, Z" format? Since it says it allows range for every coordinate, would restricting the rule to something like "40, 0-255, 40" mean it would be in an 80x256x80 area around the player? Is there a way to do something like that but using a block as the position center (instead of the player)? As for the "chance" tag, what is the range of it? Does "0.00" mean 0 chance of spawning? Would "1.00" mean 100% chance of spawning, or it's added on top of the default chances? For example, if I wanted to increase spawn rates of X mob, would I use "mob:entity & chance:1.00"? Or would it have to be bigger than 1.00 ? Sorry if they are dumb questions. The range of "chance" is 0.00 to 1.00, which means 0% to 100% probability to apply the entry. For example, "dim:1 & chance:0.95" means greatly reduce the spawn rate of enderman (or other creatures in The End dimension). In current (old) version, There is no way to increase spawn rate for a specific mob. New version will come out soon in few hours. Oooooh! I see! :D That's awesome! Is it possible to get version 1.1.4 of the mod for Minecraft 1.9? A lot of the mods I use have still not updated to 1.9.4, so I'm sticking to 1.9 for now. Can You Add Configurable Exeptions to this rule?